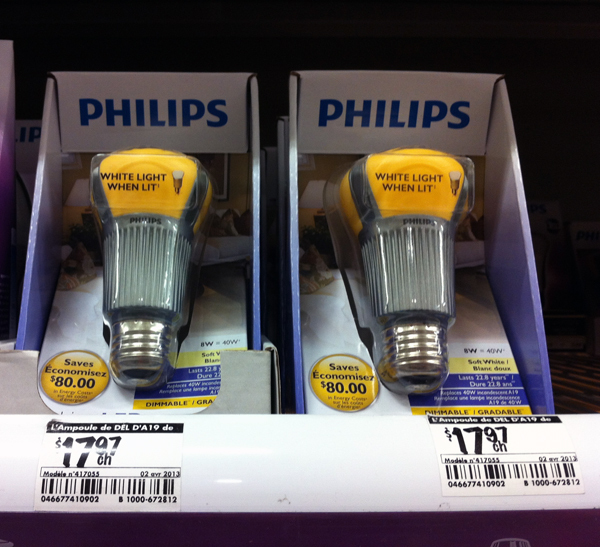 Philips LED lightbulbs on sale in a Canadian hardware store. The lightbulb, right? The good old incandescent lightbulb. Well, it’s maybe not so good anymore. Or comparatively speaking, at least. New lights that boast better energy use and less waste heat are changing the field for the better — or so some would claim. Others prefer the light and warmth offered by the old-fashioned bulb. No matter which side you’re on, the fact is that there’s more than one way to light a room, and we’re talking all about it in this episode. So settle in, give us a listen… and then maybe get in on the conversation!